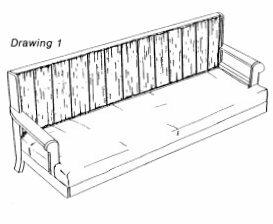 How-to Article for constructing ChannelBack furniture. 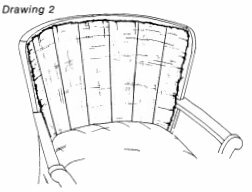 The quilting method would be found more in the auto or marine interior upholstering but can be applied to furniture applications as well. Laying out the quilted channels is largely based on common sense. Large channel widths look good with large pieces only. Laying out , if starting from scratch , first look at some examples of furniture , boat or auto interiors. 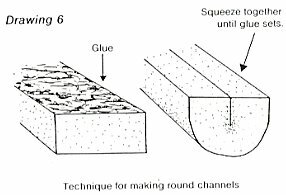 For the quilted channel construction you will need a cloth backed pleating foam. This foam sheet is available in 1/4 and 1/2 inch thickness. To add channel thickness these can be doubled or additional foam added to each channel while sewing. 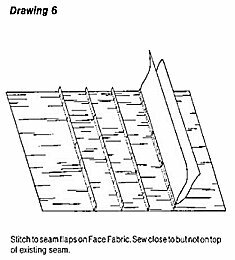 The options for marking the channels either on the face fabric or on the cloth backing of the pleating foam is personal taste. But if marking on the face fabric or vinyl, mark with a removable substance or you will have the sewing line marks visible after the sewing is finished. 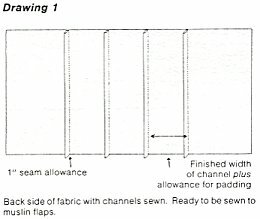 For channels that are made with additional fillers , sewing the channels with the face fabric facing up would be easier to add filler and sewing the channel. 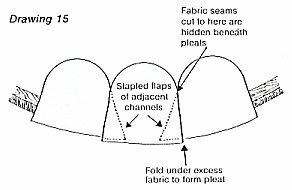 Another method to quilted channels is to cut each channel separate and sew each cut fabric channel to the pleating foam. Once you have all the channels pieces sewn you than can sew all the pieces together to make up your channeled fabric cover. 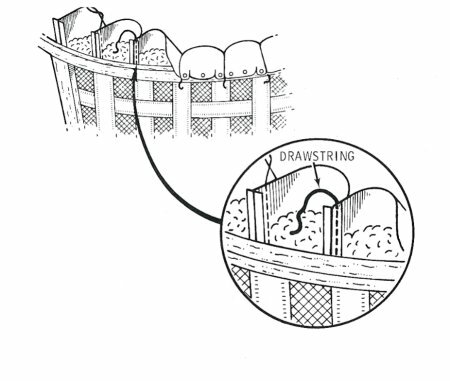 The draw string is sewn by means of a pocket. 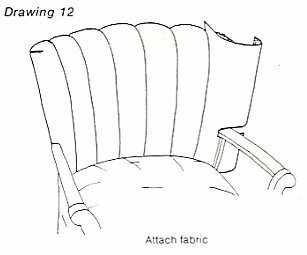 Fabric is marked for the channels with an allowance for seam and add the draw string while it is folded leaving enough twine to pull and secure with tacks or staples at the top rail and bottom rail of the chair's inside back. This method is not one of the popular proceedures and the over all out look is not as quality as with the other methods shown. 1. The first step is to determine the measurements of each channel and the number of channels used. Equally important is the pattern in which they will be arranged. Use a marking pencil or soft lead marker to mark the position of each channel on the burlap ( or muslin ) under layer. Find the exact center by drawing a line in the middle of your surface from each side and mark the middle of the top all the way down to the middle of the bottom surface area. centered. This will be your center point. You will either have the center as a seam or center of a channel that will be determined by the number of channels for the width of the surface your channeling. This you would have to determined when you do your mark out of the channels. You will want to have the same size channel at each end of the surface being channeled. 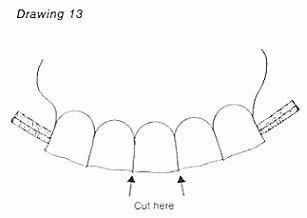 Once you have the markings on the under layer start from the center mark and attach as shown in diagram either by hand sewing or tack/staple ( if applying channels to a hard surface.) From the center work out to each side until all the channels are filled and fastened. The is the end of the Channel construction Part I Please view parts II and III of this instructional series. The Adjustable backing Method uses individual flaps of muslin sewn to the seam allowances on the back of the Face Fabric. 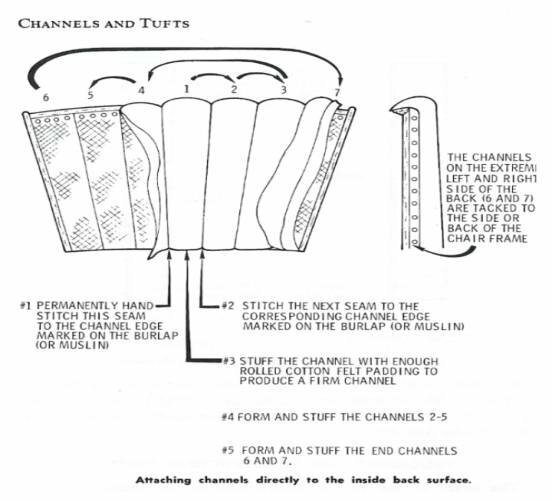 These muslin flaps are then drawn around the padding and joined to form the backing for the channels. 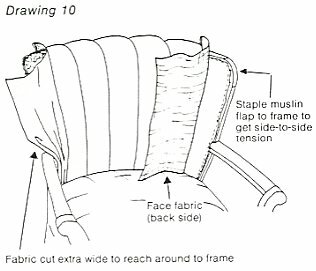 this method of construction gives an Upholsterer precise control of the amount and placement of stuffing as well as the tension of the fabric drawn around it. 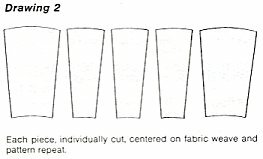 When cutting out for a curved surface, like a barrel-backed chair, the channels are made up of individually cut, wedge-shaped pieces (drawing 2) which are laid out on the Face Fabric so that each piece is centered properly according to the weave of the fabric and the repeat of the pattern. 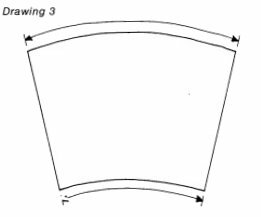 The "wedges" are then sewn together with 1-inch seam allowances to form a "fan" (drawing 3). 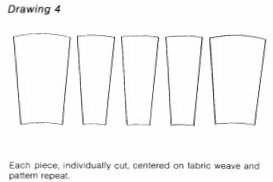 Next, strips of muslin are cut (drawing 4) to match the length (top to bottom) of the Face Fabric and approximately 14 inches wide (dimensions will be explained next issue). 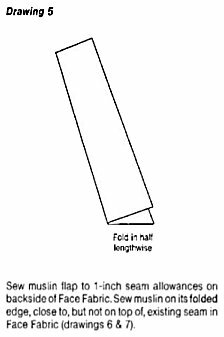 Fold the muslin strips in half lengthwise (drawing 5). Sew muslin flap to 1-inch seam allowances on backside of Face Fabric. 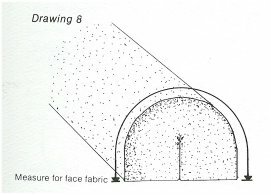 Sew muslin on its folded edge, close to, but not on top of existing seam in Face Fabric (drawing 6 & 7). 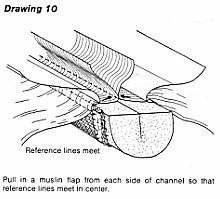 Taking one muslin flap from each side of channel, draw them together until both reference lines meet in center (drawing 10). 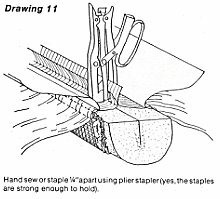 Using plier stapler, staple 1/4 inch apart on reference line (draing 11). Staples are more than strong enough to hold for the entire life of Face Fabric. The Upholsterer is able to precisely control the exact amount of tension put on each channel as it is stapled closed. he can also place stuffing exactly where and how he wants it. The finished unit is ready to attach to the frame (drawing 12). End channels are stuffed after the unit is secured to the frame. If this is a new method to you, we suggest that you experiment around with some scrap fabric and make a "mock-up" of a unit. We hope you'll be pleasantly surprised at the control this method gives you. If you have any comments, variations, or alternative methods you think our readers should know about, please send them in! Any contribution used will be acknowleded to the writer. 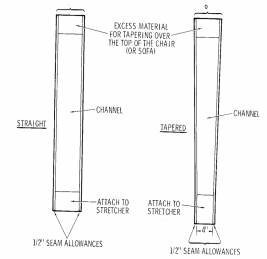 This is the final installment of a 3-part series on Channelback (Tuck & Roll) construction. The need for a Mock-up: We often find ourselves looking for the "magic formula" that will enable us to achieve success on our first try. This section covering Calculations, Allowances, Padding Construction, & Finishing Techniques contains no magic formulas. As far as we know, there aren't any! There is no substitute for making a trial "mock-up" (using the actual fabric, if possible). This enables you to adjust for the many variables, (padding thickness, fabric stretch, foam compression, etc. ), before you are stuck with your decisions. Anyone who shortcuts this important step will be gambling on being lucky, and the quality of their work will reflect it. Laying out the channels is largely based on common sense. In most cases you will have the old channels as a guide, (but don't use them as exact patterns unless you want to copy someone elses mistakes!). If you are starting from scratch, make a trip to several furniture stores to get an idea of what size channels look good on the style and size of the piece your're working on. Be sure to note the thickness of the channels as well as their width. In general, larger channels look good on larger furniture, and smaller channels are best on smaller pieces. 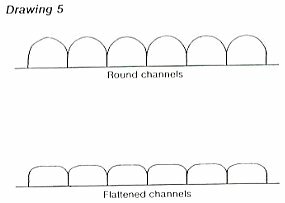 In laying out for channelback, there are two width calculations to be concerned with: finished width is the distance the channel travels across the frame. It is used for the muslin that forms the back of each channel. Actual width is the distance the face fabric travels around the thickness of the padding to form the front of the channel. Length will be discussed later. Padding Selection & Construction It is necessary to decide on padding thickness and width before doing anything else. You will need to measure around the fullness of the padding to determine allowances for your mock-up. 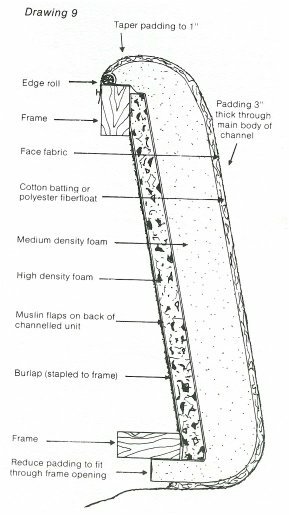 Foam is recommended as the best padding for channel consturction. It is easily worked, doesn't get lumpy and has the necessary resiliency to provide comfort. Rolled up cotton batting is not recommended because it packs down in use and becomes hard as a rock! Stuffing channels with loose curled hair is recommended only with leather, mohair, or other fabrics whose life expectancy greatly exceeds that of the best quality foam products. In most cases, best-quality foams will hold up as long as the fabric does. 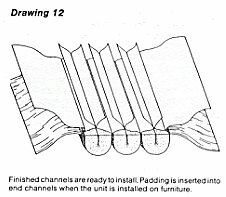 Since the channelback unit (with padding) has to be completely disassembled each time it's reupholstered, there is no advantage to using the longer lasting hair padding. 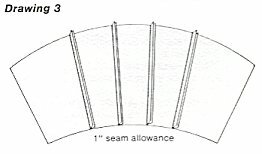 Foam offers a number of options for padding construction. 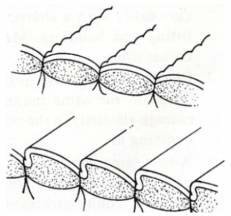 Density can be varied from soft to firm, (remember, the softer the foam. the more conforable, but the less ability it has to keep the fabric from wrinkling). Size can be varied, both in width & Thickness. Width can be anything tha looks good on the furniture. Thickness varies from 1/2 inch to 5 inches, with most channels falling between 2 1/2 & 3 1/2 inches thick. Shape can be varied according to construction technique. Spray one surface of the foam with spray adhesive and then fold it in half lengthwise so that the glued surface sticks to itself. Hold together with masking tape until glue sets up completely. (Drawing 6). 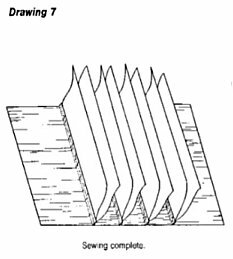 To construct Flattened Channels: You can cut a solid block of foam to shape by hand using a foam cutter. Or use this technique: Cut a piece of 1 inch thick. 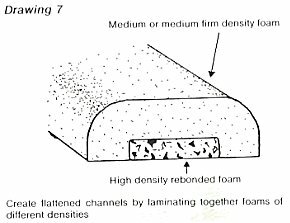 very-high-density foam, (we use "rebonded" foam), narrower than the finished width of the channel. 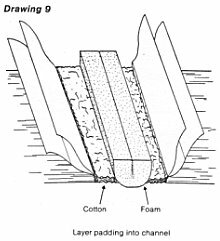 Glue a piece of medium density foam to it as shown in (Drawing 7). Top piece should be slightly wider than the actual width of the channel to allow it to completely wrap around rebond core. Experiment with a number of foam densities and sizes,(softer densities need to be over sized). to find the combination that works best. Mock-up Next construct a mock-up of the channeled unit. It should have at least 3 full channels so that you can put it up to the frame and see how the completed unit will look. Measure the foam to determine the allowance for the face fabric. 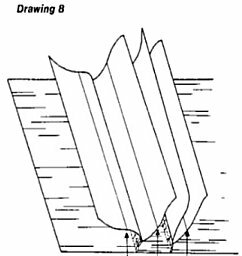 (Drawing 8). 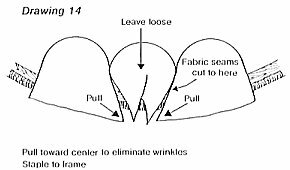 Fabric should be very snug to eliminate wrinkling. This is the actual width for the channel. Use this dimension and the finished width to lay out and construct your mock-up. It is better to use your actual face fabric for this so that you can adjust for the fabric's natural tendency to stretch. Extra heavy-duty muslin, (osnaburg), should be used for the backing material. 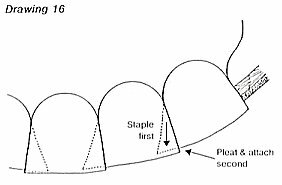 Cut your muslin flaps and construct the channels using the method described in Part II, Use 1 inch seams to join fabric. Length of fabric will be the distance from where it attaches at top to where it attaches at bottom plus aproximately 10 inches of allowance, (5" for padding, 5" for somthing to hang on to). 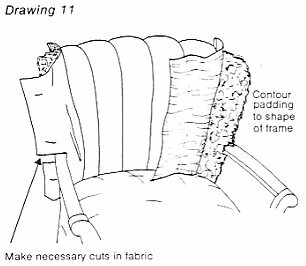 Muslin strips for flaps on back should be apporximately 14 inches wide and the same length (top to bottom) as the face fabric. 14-inch width will work for channels with a finished width (across the frame) of up to 9 inches. 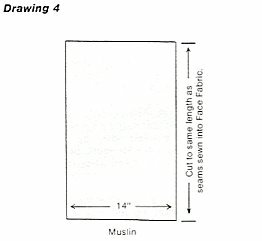 For wider channels, increase muslin width. Finishing Techniques When installing channelback unit on frame, it will be necessary to open up muslin flaps at top & bottom of channels to get in and trim padding. 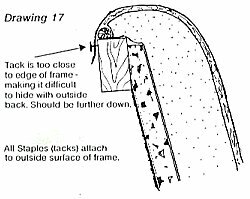 Bulk of padding should taper to approximately 1 inch at top and 1 to 2 inches at the bottom, (where it pulls through the frame opening). (Drawing 9). Padding is best trimmed-to-fit as unit is installed on the frame. Start to attach channel back unit from center out evenly toward both ends. This task is easier if you have layed out reference marks on top and bottom frame rails. End channels are stuffed after the unit is secured to the frame. To finish off channeled unit across top of frame, it will be necessary to fold pleats in face fabric. 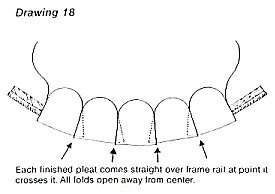 Technically, the opening of folded pleat should face away from the center of the frame. This is the method we will illustrate, but if you don't like doing it that way, it isn't a neccesity. (Most people wouldn't know the difference). Start in the center. With center channel left hanging loose, pull excess fabric of adjacent channels toward center to eliminate wrinkles. (Drawing 14). Staple to frame. Fold under excess fabric on center channel and pull over stapled flaps to form pleats. (Drawing 15). All staples (& Tacks) are attached to frame on outside surface. (Drawing 17). Keep staples toward bottom of frame rail so that they will be easy to hide with the Outside Back. Finished unit should have pleats which all come straight over the frame at the point they cross it. (They will not be parallel to each other on a curved frame). (Drawing 18). All folds open away from center. There are many variations on the way to construct channel backs. This is the best way we know. If you have a better way please share it with the rest of the upholstery Group.